Growing a variety of produce to keep you nourished and inspired in the kitchen! Why: Eat seasonally, support local agriculture, and know who is growing your food! Welcome to the 2019 growing season and the Mountain Roots Produce CSA Program. We are gearing up for another farming season and are excited to grow delicious, nourishing and beautiful produce to feed our family, friends and this wonderful CSA Community! Join us this season, whether it’s your first year as a Mountain Roots CSA Member or your seventh, and be a part of this meaningful partnership between the farmers and the members. This partnership is focused on building community, improving soil health, having a direct connection with your farmers, discovering (or rediscovering) the satisfaction of eating seasonally and, ultimately, stewarding this beautiful land so it's better place for future generations to come. Let’s do this! Click here to Join Our CSA TODAY! What is CSA? CSA Stands for Community Supported Agriculture and it is a beautiful partnership and shared commitment between the farm, Mountain Roots Produce, and you, the consumer. CSA Members purchase their share early in the year (Registration for 2019 opens on January 15th) to help the farm with the costs of seeds, implements, supplies, labor, etc. that arise early in the season. And in return, the CSA Members enjoy a weekly share of the farm’s harvest throughout the season and develop a connection with the farmers, and the land where their food is being grown. The CSA Members share in both the risks and benefits of the farm and what the season brings... and they begin to really understand what eating seasonally in Southwest Colorado looks and feels like. CSA Members will be connected with their farmers on a weekly basis, via newsletters with farm updates/photos/recipe ideas and seeing the farmer at CSA pickups, where Members are able to ask questions, exchange recipe ideas, discuss food policy, etc. We'll keep you up to date on the trials and successes of the farm, what Mother Nature is up to, the projects we're working on to grow better and smarter, and what crops or varieties we're experimenting with. 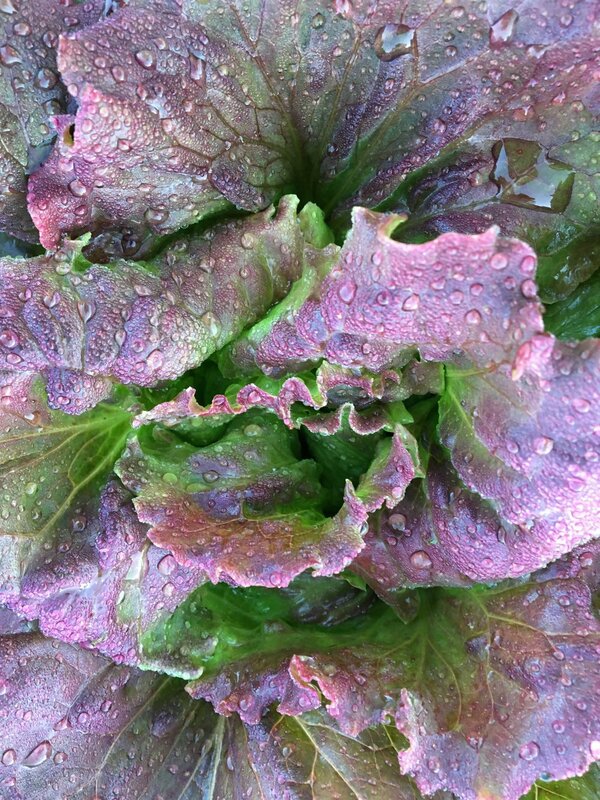 We grow a large variety of produce and plan the growing season with our CSA Members in mind. We want our palate to be diverse and exciting week to week and feel the CSA Shares should be as well. The CSA Shares will be filled with 8-14 different items each week and the contents will change throughout the season, normally lighter with many greens and tender roots in the Spring and becoming heavier later in the season as hot crops such as cucumbers, green beans, tomatoes, broccoli and so much more are ready to harvest. Why should I join the CSA? To support a couple of passionate farmers and local agriculture. To satisfy your tastebuds with our fresh and delicious produce. To get your kids excited about veggies! CSA Members tell us 'the carrots don't even make it home' or that 'my children now love turnips!'. To understand what it means to eat seasonally in Southwest Colorado. To have a direct relationship with the farmers. Know your farmer, know your food! To be able to visit the farm, touch the soil and smell the flowers where your food is grown. To be able to share recipe ideas, successes and failures with fellow CSA Members and your farmers. Who: Mindy and Mike are the owners and the farmers at Mountain Roots Produce, you can read more about their stories here. Mindy worries a little too much, and Mike tries to remind her everything will be just fine. Local Members: Pickup at the farm in Mancos on Thursday afternoons from 4:30-7p.m. Telluride Area Members: Pickup is in Spruce Park (next to The Butcher and The Baker) on Wednesdays, from 11 a.m. to 2 p.m.
Rico Members: Pickups will be on Wednesday mornings at a central spot in the Town of Rico, we're figuring out the details! During the CSA Pickup hours, Members will come with their bags, to the appropriate pickup location and collect their bounty for the week. CSA Pickup will be set up ‘market style’ this season. This means the CSA produce will be displayed on tables and a chalkboard will list the crops and amounts included in that week’s share. CSA Members will collect their produce and be able to select the carrot bunch, tomatoes, etc that they want. When: CSA Registration begins on January, 15th! We are planning and planting for the first Summer CSA Harvest and pickup to be on Wednesday, June 5th, 2019 and the final CSA Harvest for Wednesday October 2nd, 2019. **Please note the start date may change by a week in either direction if Mother Nature throws us some surprises. We will be in touch with CSA Members and communicate any changes. Price: We do our best to keep the cost of our CSA share reasonable at ~$33 per week for our Local Members picking up at the farm, and $35 per week for our Telluride Area Members. *We understand finances can be tight, please contact Mindy if you need to set up a payment plan.